In the hustle and bustle of the holidays, it is common to lose sight of what’s important. As you elbow your way towards the last Wii on the shelf or shed a tear over your checkbook thanks to all of the holiday cheer you’ve purchased, take a moment and think about the real meaning of the season. As for my family, this Christmas we are finding inspiration and joy in focusing on the positive. And, each day we are learning to realign our priorities by watching my Dad, Max Borner, who is pictured above before take-off on his first flight as a pilot since his early twenties. In March of this year, Dad was diagnosed with stage 4 colorectal cancer. Since that day, my mother, 3 siblings and I, along with countless friends and family members as far away as Switzerland, have all climbed aboard with Dad to take on the insightful journey that is cancer. Our weeks have been filled with fear, anxiety, disappointment and all of the other yucky emotions that you would expect to feel when dealing with a disease of this magnitude. What we did not realize we would feel in such enormity is the endless hope and pride that pours into our lives each day that we open our eyes. You see, Dad has redefined fighting cancer. The imagery I associate with that phrase involves him in a boxing ring with a cancerous tumor, throwing all of his energy into knocking that sucker out and focusing on little else until the referree lifts his arms and declares victory. Dad’s reality is a bit different. Sure, he is undergoing the chemo treatments and popping the laundry list of medications prescribed by his team of doctors to beat the disease, but he is combining that regimen with the best self-prescribed treatment available–he is living with cancer. Although Pops has a perfectly valid excuse to lay down and resign to moaning and groaning, he has chosen instead to get out there and do the things that inevitably bring a smile to his face, some of which include; cheering on the grandkids at gymnastics meets and soccer matches, working 40 hour weeks, taking long walks with his dogs, stringing up Christmas lights and giving my Mom a good run for her money as always. As if he’s not active enough, most recently, Dad decided it was time to renew his pilot’s license. Back in the 60’s, Dad was a pilot with the Swiss Air Force (you know, that intimidating, neutral one) until he made the big leap across the pond to marry my mom. He held fast to his love for planes but time for flying was scarce after he and my mom had the four of us. Years without flying turned into decades and the free feeling of taking flight became a distant memory. It was a surprise to us all when Dad recently announced that the time had come for him to take to the sky once again. 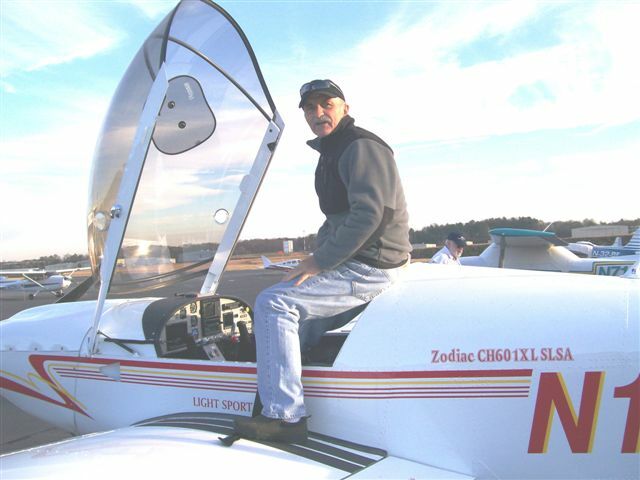 He has flown with an instructor twice over the last month and has said that the years without flying seemed to melt away as soon as he climbed into the cockpit. Each time he describes flying, you can feel the positive effect that it has on him and the hope that it brings him. Dad’s happiness is inspiring and infectious and it spreads throughout my family and beyond, reminding all of us what this crazy journey is about. So, when the holiday blues threaten to put a damper on your outlook, take a moment to remember what’s important and get out there and do the things that make you happy. Who knows, maybe you’ll inspire someone else to do the same.